When I started travelling as a consultant, I very quickly started to find a need for a portable “blogging” solution. I had my laptop, sure, but 10 years ago, a laptop sucked that little battery dry almost before the drink service on the flight had come out. After a few years, I had it down to a folding keyboard and my Palm PDA. The keyboard was great, folding to something only slightly larger than the Palm, and the two together could be up and running a text editor within seconds of the seatbelt light going off, and I got four or five hours before the batteries died. The setup was beautiful in its compact simplicity. It fit on an airline tray table. I could share a table in a coffee shop. I could set up anywhere, and I’d write, back then. Now I go out, and when there’s time to kill on an errand, I have note cards, but they’re slow and analog. 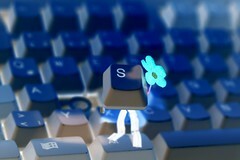 Give me a keyboard where I can spill out my words at the speed of my thought. I sat at the mall today and read where I’d rather have written. Because I didn’t have the laptop. And my phone has a keyboard, but it’s not really much fun for anything serious. If the iPhone supported one of the old stowaway style fold up keyboards, I’d get one in a heartbeat. My phone actually *does* support bluetooth keyboards, but there are no drivers for the old models that are out there and for whatever reason, the last time I looked, I didn’t find any. So where has this segment gone? Granted, I’m the only one I ever saw, but am I actually the only person who ever used this? I don’t believe it, seeing the mockups of iPhone keyboards that I’ve seen. And yet, the animal exists only as hacks. I’m considering a netbook as a poor substitute for my old ultramobile setup. A 10″ block isn’t going to fit in my pocket the way the 5″ diagonal of the Palm. But something is better than nothing. Right? Tagged with blogging, keyboards, laptops, mobile, portable, technology, writing.